GLENDALE, Ariz. — The Packers trailed the Cardinals, 7-0, following one quarter of play at University of Phoenix Stadium on Saturday night. The Packers won the toss and deferred. The two teams traded three-and-outs before the Cardinals put the ball in play at the Packers 42-yard line following a short Tim Masthay punt. Carson Palmer threw to David Johnson for 12 yards. On third-and-1 from the 21, Johnson ran for 2 yards. On third-and-9, Palmer threw to J.J. Nelson for 8 yards. Johnson then gained 2 and a first down at the 8. Nick Perry sacked Palmer for a loss of 5 yards on first down, and then Palmer threw to Johnson for 5. 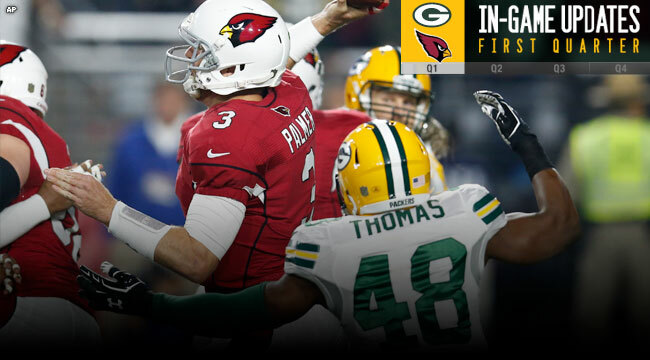 On third-and-goal, Palmer found Michael Floyd in the back right corner of the end zone for the game’s first score. Palmer put the ball high, where only Floyd could catch it. The Cardinals led, 7-0, with 6:48 to play in the first quarter. The Packers put the ball in play at their 5-yard line with 3:53 to play in the quarter. James Starks gained the Packers’ first first down. Randall Cobb dropped what would’ve been a long completion, which brought up third-and-4. Aaron Rodgers scrambled for 19 yards and a first down at the 41. Rodgers threw to Jared Abbrederis for a first down at the Cardinals 40 on what was the last play of the first quarter.